Founded by a handful of Colorado natives who dreamed of bringing premium quality CBD to the masses, CBDistillery specializes in 99% pure CBD isolate slabs but also brings a host of other products to the table. It claims that its customers are spreading the #CBDMOVEMENT with every slab they break. The company was only founded in 2016 but has already made an impact on social media and has even won an award or two. Keep reading to see if CBDistillery deserves this praise or if it is nothing more than a flash in the pan. While it may seem expensive, you have to bear in mind that you’re getting virtually pure CBD and 14 grams should last you a very long time. As the slab is hard, it is up to you to determine how much you want and measuring it is rather difficult. We love the slab’s ‘snow crystals’ appearance when it gets broken down a little and when you dab it straight, it is akin to breathing in a type of vapor. The slab’s versatility is unquestionably one of its plus points. You can use it straight, melt it down and add coconut oil to it or even sprinkle it on your food! CBDistillery claims the slab has zero THC and it comes directly from industrial hemp oil that has been extracted from the plant’s mature stalks and stems. When you use it ‘neat,’ you feel the effects extremely quickly. Its strength means it works to treat chronic pain, anxiety, stress, and a variety of symptoms attributed to common ailments. Overall, it is clean and melts easily at fairly low temperatures. We expected a lot from this tincture; primarily because it was ranked #4 by Rave Reviews in its Best 20 CBD Oils of 2018 Year list. The first three sizes (250, 500 and 1000mg of CBD) are in 15ml bottles while the 2500 and 5000mg bottles contain 30ml of tincture. The smallest bottle costs just $20 while the super strength 5000mg bottle costs $240. It is important to note that all of the tinctures are on sale at present with varying discounts of between $10 and $25. They are free from pesticides and include coconut MCT oil to improve bioavailability. In the smallest bottle, you get 250mg of CBD at a strength of 1.81%. The 5000mg is significantly stronger at over 19%. We were impressed by the fact that CBDistillery has printed a copy of the lab results which can be viewed underneath each tincture description. It is a level of transparency we have come to expect from the top brands but is seldom met. It is important to note that you shouldn’t vape the tinctures because of the MCT coconut oil which makes them dangerous to inhale. You are better off using the slab or powder isolates to create vape juice, and CBDistillery says it will be selling its own line of vape juice soon. When using the tincture, hold the requisite number of drops beneath your tongue for a few seconds before swallowing. While all of these tinctures offer value for money, the 5000mg is excellent for relieving all manner of problematic symptoms in double quick time. There is no question as to the strength or efficacy of these tinctures. The company sells a number of CBD infused products including its popular CBD capsules. You can purchase a bottle of 30 capsules with 25mg of CBD apiece for $50. As is the case with the tinctures, these capsules also contain MCT coconut oil. Its Serendipity Terpsolate is a unique product that you won’t find in the majority of online stores. It includes 99% pure CBD isolate and terpenes derived from hemp. You receive 1 gram of this product for $45; please note that it comes in slab form. It provides a lovely scent similar to mint chocolate ice cream, and it also tastes amazing. Other Terpsolate options include Jack Herer and Bubba Kush. If you want to add cannabidiol to your daily beauty regimen, try CBDdefine skin care cream. Each 1-ounce container has 500mg of cream for $50. It has a host of skin-friendly ingredients such as olive oil, coconut oil, almond oil, sunflower oil and bee wax. You should use it first thing in the morning and the last thing at night if you want beautiful skin as well as relief from medical problems such as anxiety or chronic pain. Customers looking for even more CBDistillery products can choose between the broad spectrum CBD wax and the infused softgels although we wonder how popular the CBD suppositories are! 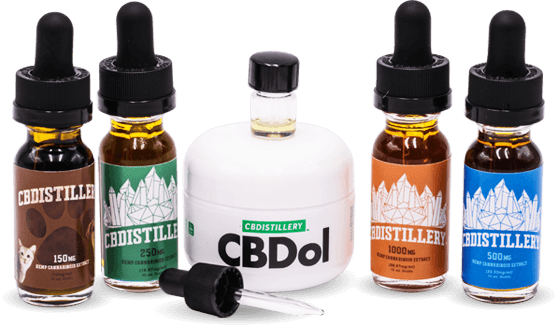 You can find all of CBDistillery’s products on its Website’s Shop Page. Customers receive free shipping on all orders over $75 once price reductions have been taken into account. Otherwise, you will pay $8 for standard USPS shipping. The majority of packages should be shipped within 48 hours of payment, and you should allow 2-4 working days for your order to arrive. Few CBD companies offer such a wide range of premium quality products. We are particularly impressed with its slab isolate which works remarkably quickly and smells as strong as CBDistillery claims. We have no qualms about the effectiveness of the company’s tinctures which are every bit as good as advertised and the pricing is reasonable. Aside from some grievances over recent Black Friday sale prices, the majority of customer reviews are positive. There is no question that CBDistillery is a CBD seller on the rise. It has already promised to release further products soon, and we look forward to this firm’s inevitable expansion.